The story of Pummarola starts in 1968 with grandmother Rosa Donna Rummo zooming through the streets of Naples, Italy in a bright red Fiat 500. The shiny, chubby, little car looked like a tomato on wheels; earning its name “Pummarola” (Neapolitan dialect for Tomato). Back then, “Nonna” owned a pizza and pasta restaurant lovingly named Pummarola. Pummarola Coral Gables located at 141 Aragon Ave.
Fast forward forty five years to 2013 when four of Rosa Donna’s grandsons opened the Coral Gables Pummarola in honor of their grandmother’s cooking. This reincarnation of Pummarola serves traditional Neapolitan Italian fast food and displays a replica of Nonna’s adorable Fiat 500. All of the ingredients used at Pummarola are brought directly from Italy including the flour, the tomatoes, and the olive oil. Equipped with a brick oven set at a blazing 900 degrees, the master pizzaiolos bake pizzas in a minute flat. So if you are in the search for an authentic Neapolitan Margherita pizza, this is the place to go. It’s fast, delicious, and straight from Italy! I got to sit down with Stefano Righi, the General Manager of Pummarola. He explained how master pizzaiolos are similar to executive chefs but they specialize in pizza making. All of the master pizzaiolos making your pizza at Pummarola have moved from Naples, Italy to Florida. They truly are Neapolitan master pizzaiolos including Gino Dapuzzo who has been cooking for over 30 years. You can actually learn to make pizza with Stefano and the master pizzaiolos at Pummarola. Every Saturday from 4pm – 6pm Pummarola offers a group Pizza Class where they teach you how to make pizza from scratch. The class includes a complimentary glass of wine and everyone eats their own pizza at the end. Participants learn how to make pizza with their home oven and Pummarola’s brick oven. The class is overwhelmingly popular and is booked through the end of July. If you are interested in participating don’t put off reserving your spot. Price is $25 per person and requires a minimum of 6 people (maximum 8 people). Stefano loves everything but he personally recommends the spicy salami pizza and the home made gnocchi. You might also want to try their best selling side dishes and desserts: eggplant parmigiana, signature minestrone, and tiramisu. I like to keep it simple and usually order their margherita pizza. You definitely can’t go wrong with that! When it comes to dessert, I agree with Stefano, the tiramisu is the best hands down. However, if you are a Nutella fanatic, like I am, you should try their Nutella pizza with strawberries and bananas. Every week they have different specials. Just drop in their location to find out their weekly specials. They also offer delivery in the Coral Gables, Coconut Grove and South Miami areas via Delivery Dudes. 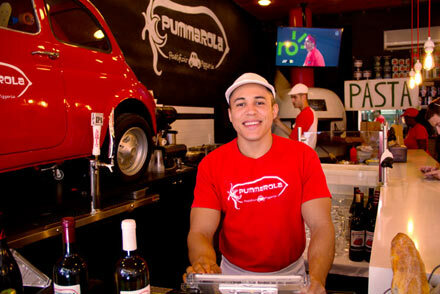 The first Pummarola location opened in Boca Raton in 2012 where you can find Nonna’s original Fiat 500 on display.